This page (written only by Barry S. Roffman) updated on 8/17/2017. Early in our joint research we noticed that for much of the Viking 1 pressure data presented by NASA’s Professor James Tillman (at http://www-k12.atmos.washington.edu/k12/resources/mars_data-information/overlay.gif) and shown again on Figure 1 (especially in the lower left corner and on the right side) for an Ls range about 30 to 220, pressure was essentially the same for identical sols over 4 Martian years. In fact, it was so similar that without the four colors used (red, green blue and purple) by Professor Tillman, it would have looked like a single Martian year’s curve. Given the active weather systems seen on the planet, this seemed strange. There were noticeable differences that were shown when there were global dust storms in 1977 and 1982, but given the similarity in darkening of the sky on both planets, the pressure increase on Mars was remarkably small. For the parts of the year when no dust storms were present, we became suspicious that the matches over four Martian years were too much in agreement. This suspicion seemed to be confirmed by the fact that whenever we alerted JPL public relations Guy Webster about pressures that appeared to be somewhat or enormously off the expected pressure curves, those pressures that were published by their MSL Rover Environmental Monitoring Station (REMS) team in Spain, were then changed by them to match what we expected to see based on the Viking 1 and Viking 2 curves. See Figure 2 and Table 1 below. We noticed that each time we highlighted something unexpected, the REMS Team either altered it to what was expected, or changed the data to read "Not Available." Just as it's unreasonable to delete hurricanes and tornadoes from terrestrial weather reports, and just as it's unreasonable to delete global dust storms from Martian weather reports, it's unreasonable to delete unexpectedly high or low pressures from Martian weather reports. We can't understand weather there by artificially removing pressure anomalies from the data just to make pretty curves. Figure 1 above: The top and bottom curves show pressure fluctuations over 4 Martian years at Viking 1 and 2 sites. An approximation of the MSL data for its first year is in black between them. On the left is a reproduction of the Phoenix data. The Phoenix and MSL data most closely matches Viking 2. Adapted from the Tillman, Viking Computer Facility, from Nelli et al., 2009, and from the REMS Team and Ashima Research. MSL and Phoenix carried similar Vaisala pressure transducers. We suspect that MSL pressures published were fudged approximations founded on the accepted Viking pressure curves shown above rather than legitimate pressure readings. The 11.49 mbar pressure for Sol 370 was removed by JPL after we made an issue about it. The 11.77 mbar and 12 mbar pressures for Sols 1160 and 1161 (November 10-12, 2015) both exceed the 11.5 mbar capability of the transducer on MSL, but they were also reduced later. Figure 2 above - It was quickly noticed after the MSL Landing on August 6, 2012 that there were often higher than expected pressures that JPL was revising downward. Table 1 shows some (not all) of how JPL/REMS altered off the curve data for August and September 2012 and August 2013 and on through at least August 13, 2017 after we either brought the deviations up to JPL Public Relations Director Guy Webster, or published on our davidaroffman.com and marscorrect.com websites. Figure 3 - Sol 829 is another example of how JPL changes questionable data to put it on the expected curve. So far JPL has not permitted the unrevised publication of any pressure change in MSL Year 2 that differed by more than 7 Pascals (.07 mbar/hPa) from the pressure at the same point in the Martian orbit in MSL Year 1 - see Table 2. This is consistent with what they published for Year 1 (relevant data for Year 1 can been seen on Table 1 where they did not like data that differed from the previous sol by more than 7 Pa). In general, if the pressure curve is going up JPL tends to remove or alter data for sols that show a decrease from the previous sol. Likewise, if the pressure curve is declining, they tend to remove or alter data for sols that show an increase from the previous sol. There are some exceptions to this trend around times of maximum or minimum pressure for the year, but in general loyalty to the Tillman Viking 1 and 2 pressure curves rule even though they were related to an understanding of carbon dioxide sublimation or freezing at both poles that was later shown to be overrated. REVISITING THE ISSUE OF PRESSURE CHANGES IN 2016. Between July 3 and July 11, 2016, as I swam laps in our condominium pool at night, I enjoyed looking up into the sky over our home in Cape Canaveral because the view of Mars was spectacular. So, without consulting any books, I knew that there was no excuse of Mars being on the wrong side of the sun to explain why NASA/JPL and the REMS Team had no weather data for sols 1389 through 1397 (see Figure 4 and Tables 4A and 4B below). Then, when they resumed data for Sol 1,398 (at Ls 184), the pressure offered (751 Pa) was far too low based on pressure for the same Ls in MSL Years 1 and 2 (772 and 770 Pa). I expected to see about ~770 Pa. But the pressure for Sol 1,399 was right back on the expected curve at 770 Pa. I don’t know if the 751 Pa for Sol 1,398 was based on a partial sol of pressure, with instrumentation just coming back on line. Maybe that will turn out to be the excuse. 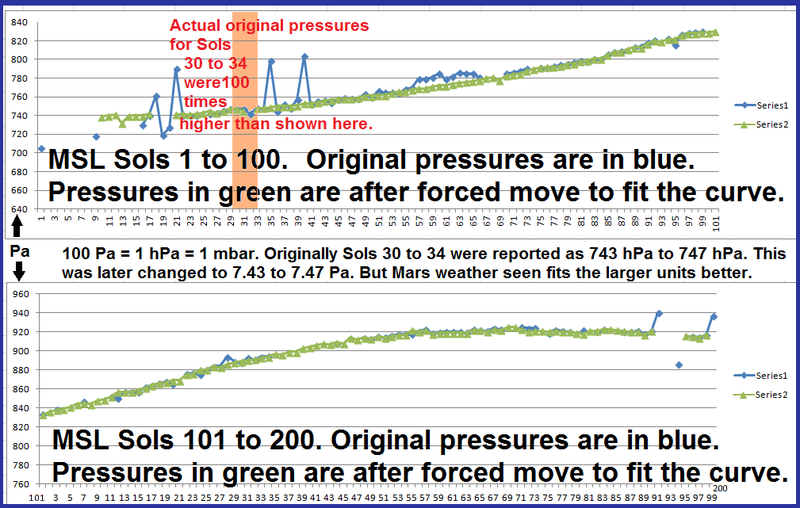 But the return to the exact pressure expected on Sol 1,399 was likely due to what I have seen before – manipulated data. If JPL can provide evidence to the contrary we will publish it. But the graph below and the tables that follow it illustrate what we have seen all too often before, and that’s a problem, especially for SpaceX if it wants to beat NASA in sending people to Mars. Underestimating pressures there can have catastrophic results. Figure 4 - Pressures from the 732 Pa minimum pressure on Sol 1,334 (Ls 148) until Sol 1,404 (Ls 187). Note the lack of data after Sol 1,388 until Sol 1,398. It can also be seen that pressure data for Sol 1,398 is well below what would be expected and what is claimed for Sol 1,399. 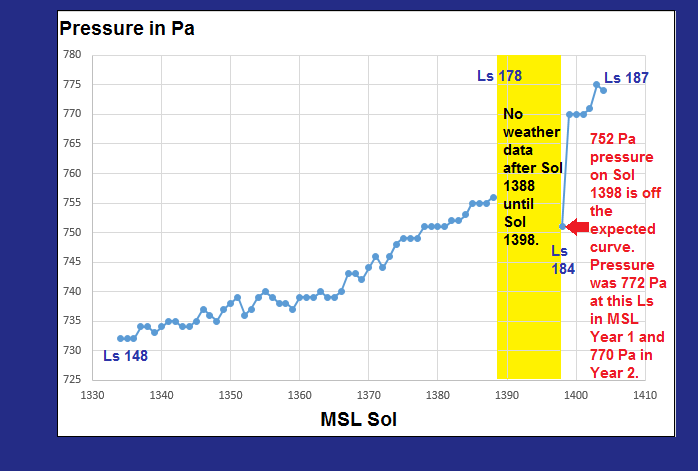 Table 4A below - MSL weather data for Sols 1,334 to 1,392. The REMS Team published no data for MSL Year 3 Sols 1,389 through 1,392 (and as Table 4B show, no data from there until Sol 1398). Table 4A covers the late winter at MSL in the southern hemisphere. Table 4B covers the early spring at MSL in the southern hemisphere.